The art and craft of storytelling in feature and episodic productions has been with us for more than a century, and the roots of storytelling in our culture go as far back as humanity has existed. Throughout the interviews I do with creative artists that work on these productions, we talk about the evolution of storytelling from the artistic and technical perspectives, focusing on the today. But what about tomorrow? To help me define and answer that question, it is my delight to welcome Andrew Shulkind. Andrew is at the forefront of a new generation of storytellers that want to redefine the entire cinematic experience that has been confined, for better or worse, to a hard flat rectangular surface in the movie theater, in our living rooms, and most recently on our mobile devices. Drawing onto his diverse experiences in the realms of augmented and virtual reality, we dive into what the near future holds for both creators and the audiences, tapping into data to understand what works best, the technological challenges on the road ahead, overcoming the inertia of the traditional world, and immersing the viewer in new, exciting and yet-uncharted realms. Andrew Shulkind comes from a classic background in traditional cinematography and continues to shoot broadcast commercials and films for theatrical exhibition. 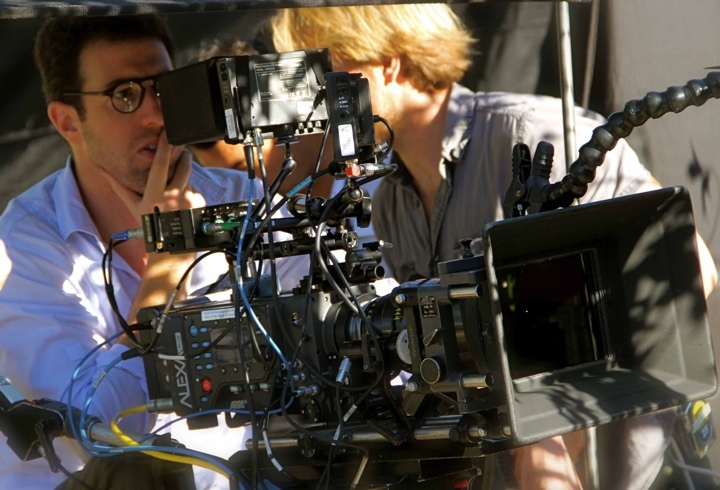 Andrew: After film school at NYU, I worked at Panavision, and joined the Cinematographer’s Guild. I moved up the ranks from Camera Assistant and Camera Operator to Remote Head Technician and then Cinematographer. I cut my teeth on a bunch of big studio movies where I moved up quickly as an apprentice under some of the best cinematographers in the business like Janusz Kaminski, Darius Khondji, Emmanuel Lubeszki and Don Burgess. Looking back I see a much clearer line to the present than it felt at the time. Early on, besides camera assisting, I was helping with color management. 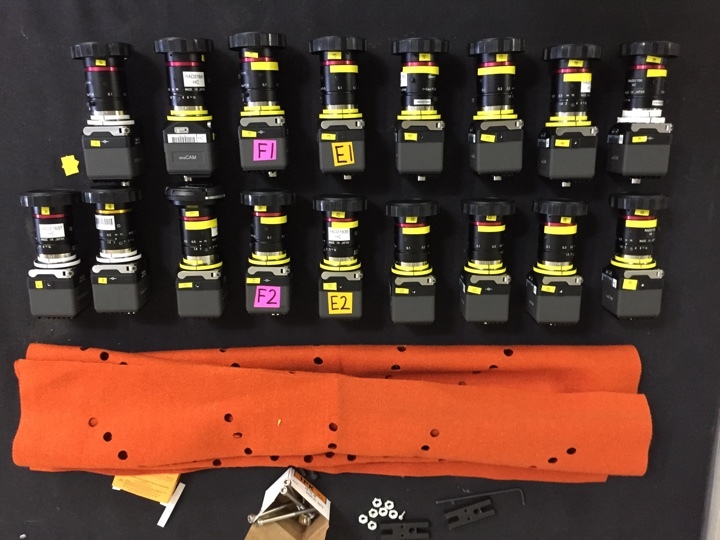 Kodak and Panavision had jointly developed a piece of software called the PreVIEW System that allowed cinematographers to virtually emulate nuanced looks to visually communicate to the lab how we wanted the film processed, back when it was all photo-chemical. For 100 years, motion picture film was processed using printer lights, playing with intensity, brightness and density of red, green and blue, and you would influence the look of the daily film processing (called “dailies”) to get the dailies to get you as close as possible what you wanted the final look of the film to be. This new system allowed us to experiment non-destructively earlier in the process, making the need for a fixed reference for the lab even more important. I became the liaison between the cinematographer and the film laboratory to communicate those choices. As that process moved beyond printer lights to scanning the film for a digital intermediate (DI), it required an even more specific language for delivering the original creative intention through technical means to achieve a digital finish. All this is to say that we as we’ve moved from photochemical photography to capturing on photosites and finishing digitally to watch a panel of pixels on a screen or mobile device, the business of capture is changing because suddenly we’re photographic more dynamic range than we can display. This reality requires us to decide what information we want to keep, what we’ll throw away, and it becomes as imperative to be able to communicate this abstraction to others how we want this thing to look when it gets delivered. I’ve always been interested in the intersection of art and technology and each role I’ve had is a different blend of those two fields. In the commercial and music video world, I liked to find efficient ways of working in new emerging technologies and ended up being asked to shoot product tests for new camera, storage, and lighting manufacturers. I do a lot of visual effects heavy stuff and we are always using compositing, and motion control and motion capture, so I spend a lot of time activating emerging technology in the pursuit of dynamic storytelling. We shot a bunch of early interactive content, including the first piece of content designed for an iPad; we built a tiny stereo 3D camera for shooting live action handheld, I often get to play with LED and plasma lighting and other technologies before they come out because on set we’re always thinking about what we can do to save time and money and tell the story efficiently and differently. And the tools that we have to do that is increasing exponentially by the day. Then, around four years ago I was doing a commercial that required us to shoot 360° background plates. We needed a professional level of resolution, color gamut, reliability and monitoring. It didn’t exist so I brought together some partners to finance and build it. In so doing, we ended up building a high-res 32K 18-camera 14-bit uncompressed camera that remains the highest quality capture device for shooting 360˚. We used it on a ton of other projects in this space, but other commercial and film producers and directors and studios that I had worked with in the past started reaching out for 360˚ expertise and so I ended up doing a lot of early 360° VR projects for various companies like Samsung, Google, Nokia, Facebook and others with my camera and others. Then it moved to those folks reaching out to have me consult on how to build or optimize their 360˚ cameras. 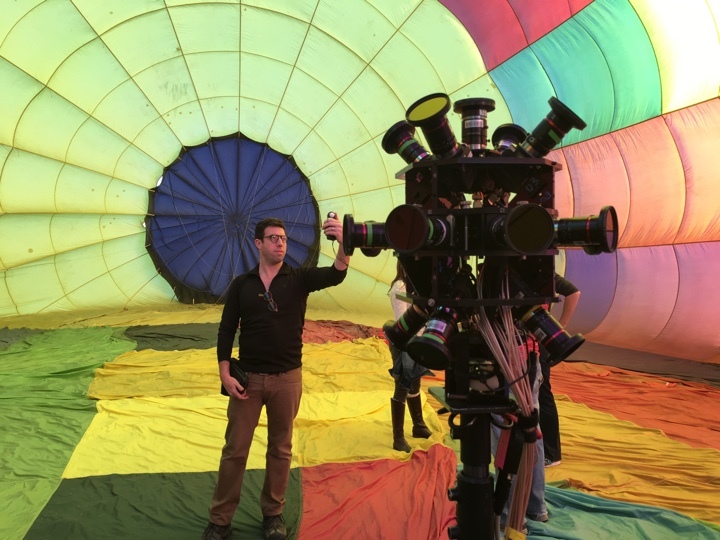 Andrew Shulkind inside of a hot air balloon for an automotive project for Chevrolet. From there it moved into helping agencies, brands, networks, and studios, strategize how they can best use VR/AR content more efficiently and more strategically. All the while, I was still shooting traditional commercials and movies. So immersive consultation morphed into consulting and speaking about overall content plays to shape the future of entertainment content, bridging how traditional media, advertising, sports, esports, live streaming, immersive, and interactive content, and gaming rely on each other as part of a bigger strategic initative. About two years ago, I was producing a movie property and that macro level of awareness got me thinking about how inefficiently properties are valued with all the data we have at our disposal. So a group of data scientists and I started developing a toolkit to scrape web data and user behavior to understand audience sentiment. You analyze that and start making assumptions on how a product or a property will perform in a market – whether it’s a product, a personality, a film, or a commercial. I think a lot about algorithms and how well it works for Spotify, how challenging it is for Netflix, and how studios think this kind of technology undermines their secret sauce. In some ways, when Netflix adds a movie to their library, it seems to make it harder for users to find what they want instead of easier. You have new tools and techniques that allow us to tell stories in different ways, but if improperly curated, it becomes a mess. As a storyteller who has spent a career integrating technology in authentic ways, I feel a responsibility to get involved. So that’s what has driven what I’ve been up to this minute. Kirill: Looking back at the history of film as a storytelling medium, we had a few big transitions – from silent to sound, from black-and-white to color, from film to digital. But all throughout it remained this flat rectangle, with a well-established vocabulary of telling stories in that medium. And when I think about VR and immersive storytelling, it feels revolutionary instead of evolutionary in this regard. It feels like such a completely different environment to be telling stories in, with a completely different vocabulary to be established for the audiences. Andrew: I like that you put it as evolutionary vs revolutionary. It’s an imperative challenge. How do you bring the best of what has come before to this nascent chapter of the business? You don’t need reinvent the wheel, because there’s a lot that is working narratively. But at the same time, there’s a lot that is borrowed from the gaming world which is driven by what is fun to interact with. Most games are not driven by a great story, and you can argue that a story is second to the interactivity and how fun it is to engage with. We’re at an important crossroads where those two worlds are converging. From the business standpoint, everyone looks at the success of the gaming world and compares it to the social success and the business shortcomings of the film world. The challenge is how quickly will the future of storytelling be defined by immersive and interactive content. Maybe it’s a function of what happens when a new technology that comes out so quickly. We’re moving at an insane pace of acceleration. We’re literally beating the Moore’s law, at least in terms of (camera) sensors and sensitivity. Right now there’s a reticence on the part of content makers, producers and distributors about how much to spend and where to spend it. Partially a pragmatic judgement call to wait and see where the chips fall, largely a confusion about what virtual environments are, and partially a real skepticism about this flashy thing that doesn’t yet have a proven ROI. But there is a reluctance to allocate money and talent needed to make great content. And there’s Google and Samsung and Facebook and Snapchat soliciting as much content as possible from people that are new to storytelling altogether. It creates a weird environment that is being first defined by the low end without generating any really top shelf AAA content. On the one hand, that’s the best way to get people engaged in this interactive storytelling, building rules and establishing communities, but at the same time, we have to engage the professional market and experienced storytellers to bring what has worked before to demonstrate the return on a quality piece of content. It’s a weird crossroads, and we have to power through it. Inevitably, what will happen is that it will be more driven by interactivity, from the advertising standpoint and from the standpoint of the distribution model. In order for it to work artistically, you need people that have a voice. Right now, the voices that I love come from either the gaming world or the traditional content world. It’s a challenge to have those people involved. I was just at the Camerimage festival in Poland, and while everyone is invigorated by what is happening with immersive content, there is a significant and valuable group that is concerned about the survival of the traditional world and the ways it has been refined over the last 100 years. 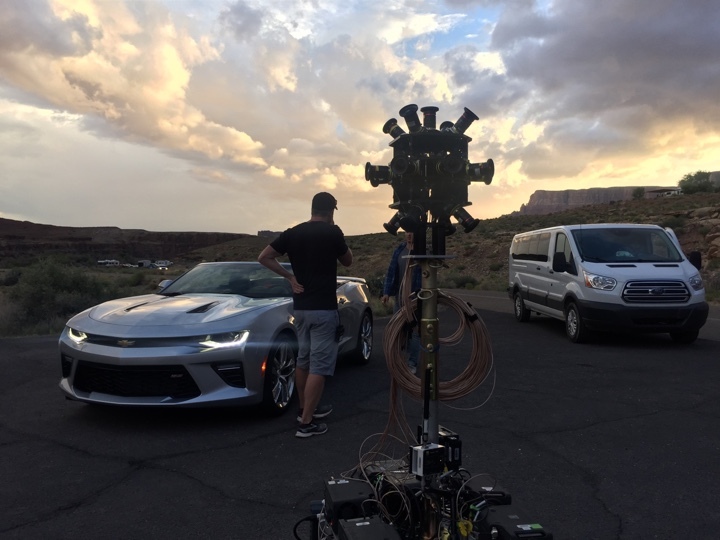 Capturing the nuances of sunset with the Headcase Cinema camera for the 2016 Chevrolet Camaro near Page, Arizona. Kirill: When I hear the word “immersive”, my impression is that I’m no longer a passive consumer of the content, that I no longer just sit there and stare at a fixed rectangle on the screen. It used to be this one “wise” voice telling the story to his or her tribe, a very one-ended relationship of a sort. And perhaps there’s not going to be that tribe anymore in this new world. Andrew: I have a lot of conversations about that rectangle that we’ve grown accustomed to. Will every story be told in 360°? Will every piece of content be interactive? Some will, and will benefit from that engagement. But some won’t. Even if you have the agency to walk around in all directions, that’s not always the appropriate choice. Interactivity isn’t the opposite of that narrative experience, its the future of it. it is an evolution of what it means to be surrounded by a story. Inherently, people connect with human stories. It will take some time to adapt to it, but not too long. I watch my kids with games or any other content. They want to swipe on my TV. They want to look around. And I even find myself doing the same when I’m shooting interactive stuff. I read a book and I’m trying to swipe up [laughs]. Maybe it’s because of the smartphone interfaces and the familiarity of it. But with the rapid acceleration of technology in entertainment, our lexicon of film grammar could be overwritten in a generation. At the same time, we’ve always had immersive stories. Cave paintings are not confined to a rectangle. Caves are painted on all surfaces. Think about the Bayeux tapestry and museum dioramas, haunted houses, and the orchestra pit at early movie theaters, Cinerama and surround sound. The process of enveloping an audience in a story has always been the goal and has been driven by the pace of technology. But immersive media doesn’t always mean 360° capture. I doesn’t have to be all around us. I’m doing some stuff for a sports league now, where you still are looking in one direction, but you can swipe and rotate the overlays with statistics. It’s a version of immersion that doesn’t necessarily mean that you have to look in all directions. We have a project where you’re watching a show in a rectangle, and you are getting time-appropriate Twitter push notices from a character in the show you’re watching. It’s the idea of being surrounded by the story instead of being surrounded by images. That is what is changing now. We just have a wider canvas. Capturing 360˚ at high quality translates to a lot of data. Headcase Cinema camera rig uses 9 codex onboard recorders to capture 14bit uncompressed files from 18 cameras. Kirill: I was watching “The Groundhog Day” with my family last weekend, and it was this shared experience where we can glance at each other and see how we react to certain scenes. What happens when each viewer in the audience can change the viewing point, even when the canvas is a fixed size? Is it going to be a completely different art form? Movies are still movies, and this is a new way of telling stories? It doesn’t sound like you’re imagining this to do away completely with how these stories are told right now in feature films. Andrew: We can still have shared experiences in the immersive space. 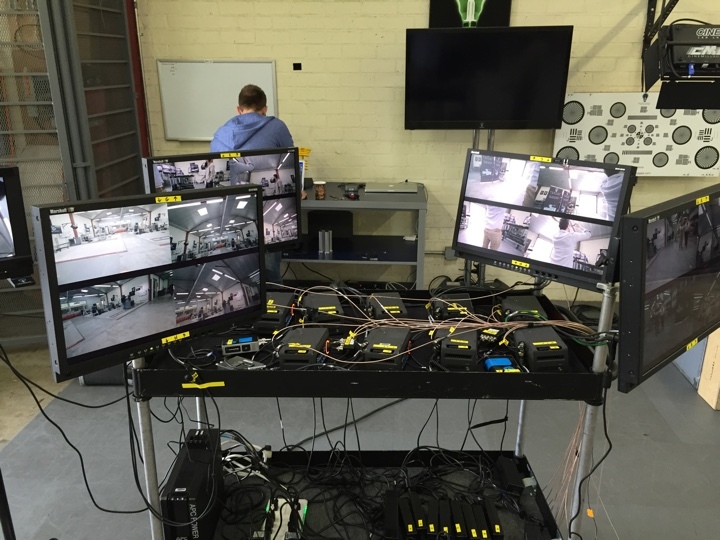 Again, not every experience is a 360˚ video that has to be seen in a tethered headset. No one says that video games can’t be shared experiences. But the social aspect will get simultaneously redefined by both the interface and by the content. But there’s another thing that needs to happen before we get too worried about how our viewing habits will change. The idea of data and what information we have about viewers will start to influence content more deliberately. That will change who watches what. Content needs to get more relevant to specific audiences, be it by age, location or anything else. Its exactly what the studios are fighting in having to make every movie broad enough to be an international mega-hit. Everybody loves Amazon’s “Transparent”, and it’s an outstanding, award-winning show that would never be made for release in theaters at the same scale. Its daring and bold and everyone loves to talk about it. But very few people are watching it. And that’s what’s amazing about it. We don’t have to serve billions of viewers at a time. We can be happy with 160,000 viewers who are paying a subscription and sharing their user behavior. Telling stories in an immersive way has a bit of a speed bump for new viewers to learn how to engage with content, especially for older audiences. My parents are over 65, they are intrigued by immersive content but the first thing that will touch them will be more targeted content to their massively underserved demographic. I think that in the next five years you will see a waterfall of properties that will go from being a feature film or an episodic TV show to become a piece of core IP that will have a bunch of deliverables. That deliverable might be weekly episodes, and something you binge-watch in a day, and something interactive, and/or something completely immersive. And all of those hint at a larger story world that you can interact with substantively in all of these different ways as a way of enriching the fan engagement. Let’s be honest, we all know that the social construct of a movie theater is on its way out. Maybe it will go the way of the opera where you go once a year for some big event. It will last longer in smaller markets. The idea of the social aspect of watching something together will stay, but maybe the rectangle you’re watching something on will be your whole wall, or an augmented reality wall where everybody is wearing glasses. You don’t need to pay for a 65″ TV screen. You’re streaming it to your glasses, or projecting it on your wall, or immersed in another world while cramped into an economy seat without any legroom at the back of an airplane. 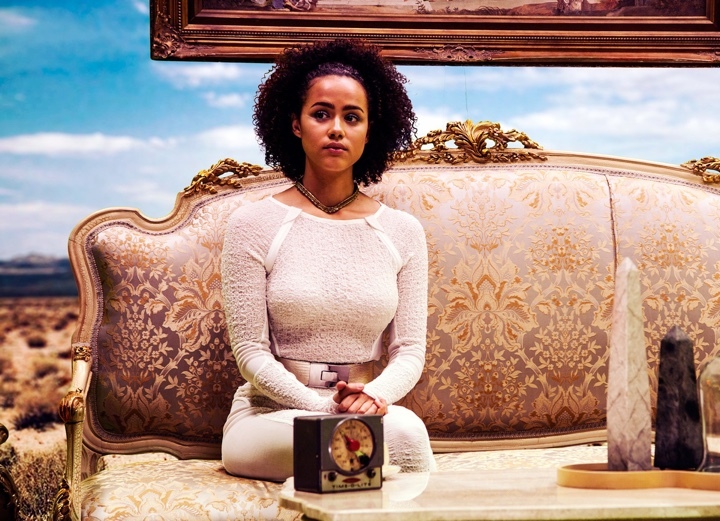 Still from “Waves” featuring Reggie Watts and Nathalie Emmanuel, which premiered at Sundance’s VR showcase “New Frontiers”. Kirill: What are your thoughts about the physical form factor of such glasses? Going back to my last question about our shared family experience of watching a movie together, I would hate it if I can’t glance at my kids’ faces to see their first-time reaction to specific scenes in my favorite movies. Andrew: I think headsets are a real problem. When I say glasses, I don’t mean a big headset. What we have now is a short-term solution because we don’t have mobile processing power or bandwidth to be able to watch at the fidelity level that we expect or need. I suspect that this will massively change in the next 2 years. In the meantime, the question is whether people will accept a lower level of quality. Would they be willing to stream 240p or 480p (which we would consider sub-standard now for broadcast) in order to have that untethered mobile experience. People seem to be ok with it on Youtube. The headsets are a real hangup, and it’s an issue because the headset manufacturers are the ones that are driving the profitability in this business, for the moment at least. They are the only ones who are spending money right now. Kirill: I think back to when I was growing up, and I hear similar experiences from my friends now. It used to be that we all watched the same shows on the same, very few, broadcast networks. And now it feels that the storytelling landscape is much more fractured, spanning hundreds of channels for people of all ages and interests. In the world that you are talking about where we will have universes open to be explored from different angles and viewpoints, do you worry about people not being able to share common experiences, not only across different stories, but also for the same story told from those different viewpoints? Andrew: It’s an interesting point. We are at the point where we don’t have the same collective experience because there’s such a glut of content out there. There are still products that go viral. There are still products that people are excited about. Everyone is talking about “Stranger Things”. My wife doesn’t watch “Game of Thrones”, so I watch it alone. But I talk about it with other people, so there is still a social aspect to it. There’s still a version of having a social experience even if your experience is sometime alone. That is a by-product of having as much content as we have available today. Netflix is a constant mill of new shows, and unless it’s a viral show that everybody’s talking about, the chances of you and me watching the same show are fairly slim. Immersive content adds an exciting bonus because with more content than one person can perceive at a time means new information on repeat viewings. There is always something that you didn’t see the first time and that other people can suggest to you, whether the experience is 360˚ or if looking at a certain hotspot triggers a specific Tweet, you add a new dimension to the social engagement with multiple viewings and shared viewings. The big opportunity here is data. Next to immersive, it’s a parallel track that both helps and hurts. It allows people in different areas of the world to discover patterns and behaviors that are common globally, at the same time. That’s probably the best thing that the confluence of data provides us. You start seeing more of a global market, instead of domestic and foreign movies. Everyone can watch it wherever they are, in US, France or Jakarta. It’s borderless. There’s a massive opportunity in the availability and the globalism of it. 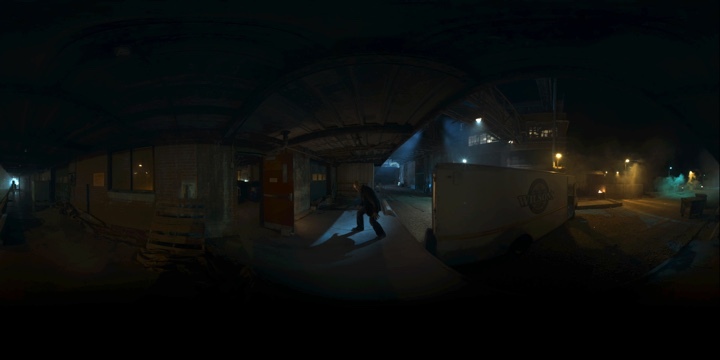 The Strain VR for Comicon. Kirill: Taking this revolution one big step ahead, what can be the next thing? Are we talking about something like “Westworld” where you can experience new worlds and stories not only visually, but also physically? It might not be feasible right now to emulate physical presence in a virtual world, but is that something that would be the next logical step? Andrew: Absolutely. We have something like that and it’s pretty rough. There’s haptic feedback that can make something feel heavier or longer than it is. You have devices that help to complete the illusion. Sometimes it’s a challenge to be able to express the right feeling for whatever you do in that virtual environment. That’s the exciting part. We have the whole world around us, and we’re learning the vernacular of what being surrounded with content or information that is relevant to the product is. It’s also the idea of experiencing it in different ways. If you look at theme parks, being able to do that in virtual spaces allows you to do it with greater repeatability. You can rebuild a virtual space to suit any piece of IP. The challenge is to understand what constitutes a story, and what constitutes an experience, and how those two work together. It’s how you define storytelling vis-a-vis interactivity. There’s a version where interactivity takes over to a point where the story goes away. The practice of “storytelling” is one of the characteristics that makes us uniquely human (along with reason and cooking our food [laughs]). We tell stories. There’s something about recounting and using our imagination to pass something along to someone else. Between data, immersive content and how all the different deliverables are now able to overlap in more purposeful ways, we are able to fulfill that need in a new way. 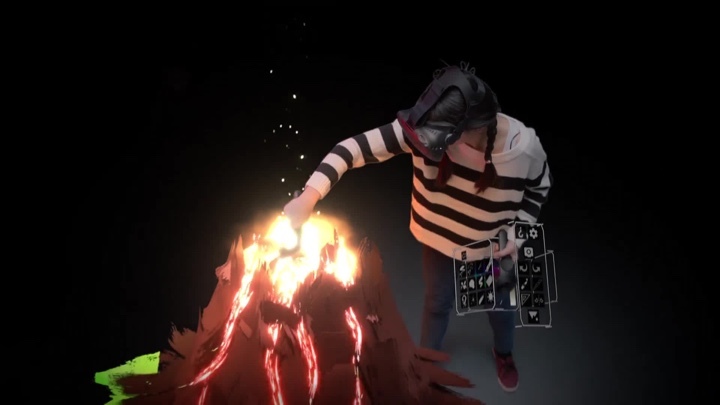 Google’s Tilt Brush launch, one of the first examples of mixed reality. Kirill: You keep on returning to the concept of data. Does that mean that storytellers should be more informed on how audiences experience their stories? Should that somehow shape future stories told by those creators? Andrew: Yes. Creativity and feedback are inextricably linked. Our lives are increasingly more data-driven…that is what Alexa and Google Home are all about. It’s the responsibility of storytellers and filmmakers that come from the traditional world to own that space a little bit more. There’s a version of it where it gets taken over by the computer. There’s a version where AI is editing every trailer. It sees what is successful, and editing could become a fully automated process. (I’m not advocating that, by the way.) But the main idea is to use analytics to understand who is watching what, and why. You use the data not only to improve compression of how it is being pushed to different groups regionally, but also to understand audience appetite and possibly even to crowdsource some content guidelines. Data is meant to be a tool that helps us make more informed creative decisions, instead of replacing the decision process itself. I don’t think we’re at that point yet. We have to model how to make those choices consciously before the AI takes over. 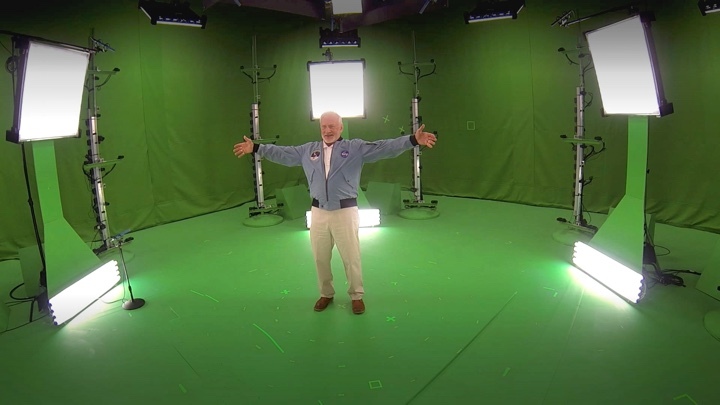 Astronaut Buzz Aldrin, one of the first men to walk on the moon, in Microsoft’s volumetric capture stage for mixed reality. Kirill: Back in film days people had to wait for the dailies to see what was being captured by the camera. In digital days, everybody on set can see it immediately on the monitors, and make tweaks live on set. And now in this new world, you’re willing to let the audience shape, in a certain way, the stories you’re telling. Do you think there will be pushback from storytellers that are used to a certain way to tell their stories? Andrew: You’re right that there’s pushback. There’s anxiety, especially among the old guard, about what is happening to the system that they know. And reasonably. But the nuance of how we light or how we tell our stories is not going away. In fact, we’re seeing the chance for a revival of the magic. What is changing is, in time, most of my job is going to be handed over to the viewer. It’s not going to happen in a year, but I would say in 10 years we will engage with content completely differently than we do now. That interactivity is happening, and there is anxiety about it. There is a way of influencing what that immersive storytelling looks like that doesn’t surrender what storytelling is. That is what I mean when I say that we can lose to interactivity or the gamification of the experience. Some experiences will be games and some will be stories, and some will be games that are storytelling or stories that you can play and modify and interact with in realtime. Most importantly, we have the responsibility to shape that now. Without our involvement, I believe that the natural course will be so interactive that we won’t be able to come back and exert the control of directing the viewer that we wanted. At the same time, in these immersive environments we are still directing the viewer. A friend of mine, Dori Arazi, is the director of photography on the new “God of War” and is programming the whole game as a one take. It’s almost like the camera is moving in the 360° space. You are telling the story through navigating the viewer on a rectangle through that space. That goes back to the waterfall effect that I mentioned before. The efficiency of data will allow us to spit out a variety of different deliverables, be it a movie, or a game, or something else. That means that you can spit out versions that are more story-driven, more gaming-driven, more interactive-driven – out of the same property. And for the short-term, the next 2 to 4 years, that’s the solution for how you continue to tell stories in interactive environments. Even now when we’re shooting, we are using simple tricks like color correction to highlight things. Think of the scene in “Schindler’s List” where the girl is wearing the red dress. There are ways of drawing the eye. Part of it is a challenge, and part of it is surrendered by us. We do surrender some of the forcing of the eye to more engagement with the viewer. Codex action cams and stitch template being prepped for the Headcase Cinema camera. Kirill: About 8-10 years ago, “Avatar” stood as the giant of the 3D feature productions, but there were dozens upon dozens of really poorly post-converted stereo jobs that pretty much killed 3D as a viable form of storytelling. Do you worry that a similar thing will happen in your field, where there will be too many poorly-made immersive experiences that flood the market and just scare away the audiences? Maybe it’s that chicken-and-egg problem that you mentioned earlier, with not enough money going into it because there’s not a lot of interest, and there’s not a lot of interest because there’s not a lot of compelling content. How do you break this circle? Andrew: That’s a great question that we are dealing with all the time. Part of it is educating content makers, and as I mentioned before, we’re in a funny place right now. At the moment, the companies that are spending money in this space are mostly creating 360° video, while we’re moving into a more volumetric space that you can walk around in or position yourself around. There’s been a challenge for live action to keep up. It’s a bit stalled at the moment. If you are in a wheelchair, or in the driver’s seat, or in any other fixed position, what kind of an experience are we talking about? I find that the only way to improve that is to get involved at a higher level. That’s why it has moved into strategy consulting alongside the capture for me. There’s a joke in the film business that the studio doesn’t know what they are doing. No matter what branch you are in, there’s always somebody who doesn’t know what they are doing. If that was true before, it’s especially true in this new immersive space. People may be too far away from the production process to understand it, and that’s the same complaint that anybody that has a boss would agree with. But the reality is that this technology is so revolutionary that there is a gap between anyone that has ever done anything and anyone who wants to do it. It’s been an educational process to help set a high bar and keep people at the table to make content good. It’s not as easy as it seems. And the other thing that I’m doing here is to encourage all my colleagues on the traditional side of things to get involved and to take it seriously. We’re meeting with trade associations, the American Society of Cinematographers, the Academy of Motion Picture Arts and Sciences, the Directors Guild, Producers Guild, to get professionals involved, and to start telling stories that matter. 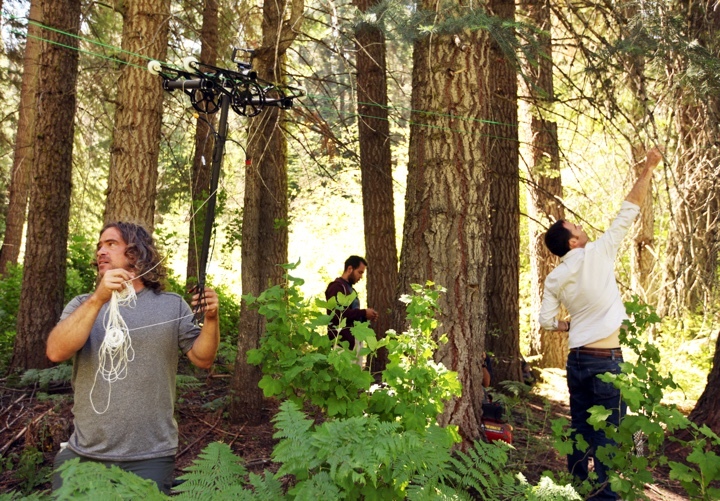 Andrew Shulkind and Steve Galle rigging a cablecam run for “Gone”, the first 360° VR series produced by Wevr and Skybound. There’s another opportunity here that I keep coming back to, which is the idea of diversity. I don’t like the idea of reinventing the wheel, and it would be a shame to lose the nuance and refinement that we’ve achieved. But we are starting with a somewhat blank slate and resetting the bar a little bit. Part of it is using the data to create targeted content as I was describing, some of which is financed by advertising. The idea is to use these refined tools to understand our users and to make good stuff. But it’s also about democratizing who is telling stories and who is watching stories. I travel a lot, and I’m surprised to see what people engage with around the world. I was in Abu Dhabi a couple of months ago, and one of the most popular shows there is “Homeland”. My mom is not interested in Marvel movies. We are dramatically underserving huge valuable swaths of the populations by programming everything too broadly. At a time when we have more specific information than ever about viewers and viewership. Right now, we can draw conclusions about who watches what and where, and rewrite that plan. But the entertainment industry is driven by the old television model with advertisers and segmented markets. In the Internet world you are streaming from a site that is accessible everywhere. We need to undo a lot of legacy arrangements that have limited us. Kirill: In the world where you use data to inform your decisions, do you see that creators will prefer to use fully digital environments and, perhaps, CGI-animated characters like we see in the gaming world? If you manage to escape the uncanny valley, you might move faster and react to the audiences’ sentiments about that particular property. Andrew: I don’t think that human actors are going away. It’s easy to see a version where virtual environments become more prevalent. Nickelodeon is already doing this. The same goes for virtual actors and motion-captioning talent. But when you play a game and you look at CG characters, there’s a human piece that is just missing. I think there’s still a tremendous value to that. There are other issues with what could go away with the increased availability of data, and using machine learning in our business. Think about when they dub an animated movie, and they have to fit the translation to fit the original facial movements. But what if we can use a sophisticated algorithm to do it the other way around – to fit facial movements to the translated version? We already have some of that with AR faces in Snapchat. You wouldn’t have dubbing any more, because it just becomes the actor’s voice, pitch and tone. I’ve always felt that dubbing was weird. Actors bring so much, and that’s one of the human things that we have to keep in the game. 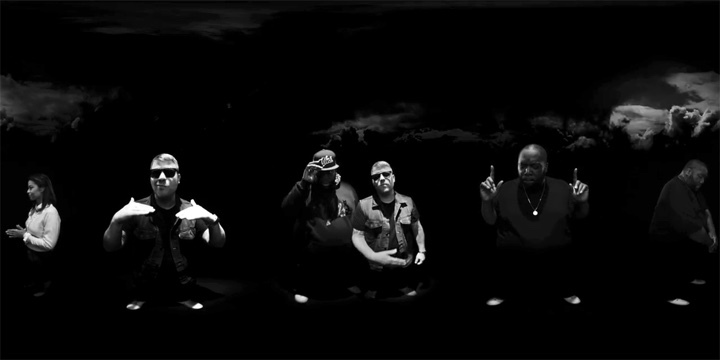 Run the Jewels “Crown”, one of the first music videos shot in 360° by Andrew Shulkind for Wevr and director Peter Martin. Kirill: You talked at length about the major hurdles that stand in the way of this new world, mostly from the perspective of overcoming the “inertia” of how stories are told today from the creative standpoint. What do you see as the biggest technological challenges right now that stand in the way of creating those engaging immersive experiences? Andrew: Right now it’s on the capture side. Part of it is being able to render in real time. Part of it is being able to capture enough data points. Part of it is being able to capture live action elements in high enough fidelity that you can process them and push that to mobile. Then you have the headsets… it’s a punchline. They are so unwieldy and so hard to work with. They are such a high barrier to entry. If they don’t improve and don’t become smaller and lighter, it could tank an aspect of this business. But it won’t tank the idea itself. The door has already been opened in terms of what immersive experiences are, and what it means to marinate the user in your content. So the biggest pain points are on the capture side, but some are on the distribution side. We need to push high enough quality to mobile. Another cataclysmic change will be when we have accurate eye tracking. Then we can even derive more specific analytics about how people are consuming content, and make interactive content more interactive and efficient. We could buffer and pause content that is out of your field of view. Kirill: It does feel like the technology on my side as a viewer needs to be much more affordable and ubiquitous. Then I can start watching those stories everywhere I go – on a flight, on the subway, or even standing in the checkout lane in a grocery store. Andrew: I was joking with a friend that it took me 8 months to see “The Revenant”, and I’m the exact demographic for that movie. I love Iñárritu, a bunch of friends worked on the movie and I’ve seen everything he has done; I should have seen that movie opening weekend. But between work, kids, and traveling, I just don’t always have time to go to a movie theater for three hours. But we do have those segments in our lives, like your example of the checkout lane. Certainly, if self-driving cars take off, everyone will have a whole lot more time. It’s about using those little leaps to deliver quality content to the people that want to see it. There’s a lot of stuff that gets delivered that I don’t want to see. As that point starts to get refined sharper and sharper, people will see what they want when they want. Then we will understand what certain subsets of certain groups like to watch. Think about Netflix and “House of Cards” that was originally driven by certain indicators and triggers. Or maybe you decide that you don’t go that route. You have this crazy idea of a script, but you have to be in a responsible position to decide that you are taking the risk that sits outside what the data would suggest. And then closely monitor its success, marketing in the most effective segments. You have to have responsible, experienced people who understand the technology in the right positions to do that. Then you can change the world. 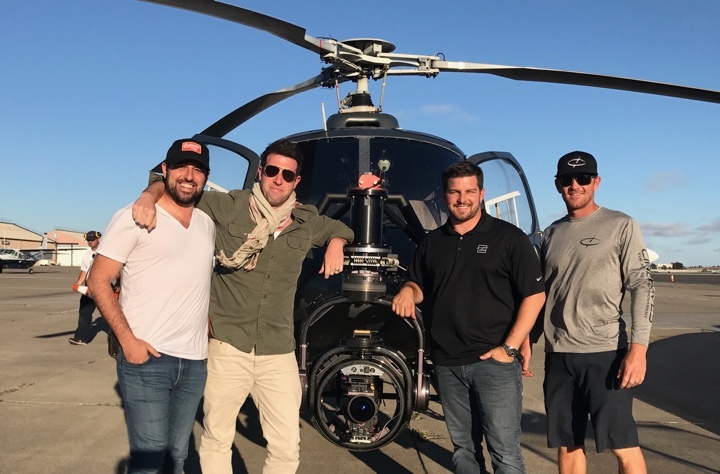 Andrew Shulkind (second from left) with his aerial crew using the first examples of shooting 220° for 360° capture on the Red Helium in San Francisco from a helicopter with the help of CineMoves Oculus head and legendary aerial pilot Kevin Larosa, Jr.
And here I’d like to thank Andrew Shulkind for a wonderful opportunity to get a glimpse into the frontier wave of storytellers that are rethinking the traditional ways stories are told and experienced, and for sharing the supporting images for the interview. I’d also like to thank Emma Altmeyer and Gabby Belzer of Impact24 PR for making this interview happen. Finally, if you want to know more about how films and TV shows are made, click here for additional in-depth interviews in this series. Stay tuned for more interviews in the near future!